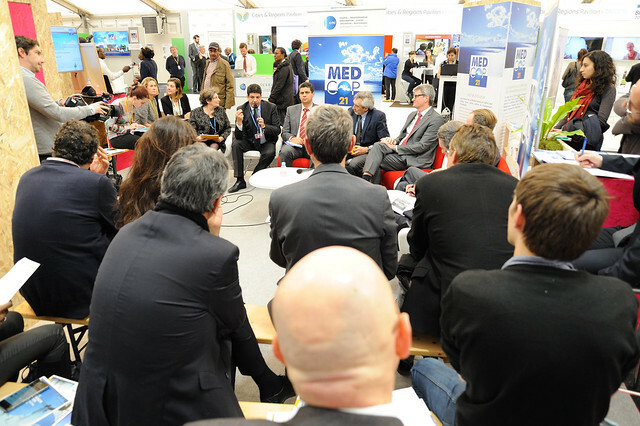 This event follows the Round Table ‘Development and climate change: financing and engineering Mediterranean projects’ which was organised by the CMI at the ‘Mediterranean Climate Summit MEDCOP21’ which took place in June 2015 in Marseille. The main recommendations of the Round Table were that financial flows should be redirected toward low climate impact infrastructure projects, climate issues should be taken into account upstream into economic, sectoral and fiscal policies and energy markets should be integrated regionally. One of the conclusions of the Round Table was that many barriers to the financing of renewable energy projects would be lifted if countries in the North would open their markets to imports of solar electricity from the South. A fully integrated energy market between Europe and the Mediterranean would facilitate the harmonious development of the renewable energy resources of the South at least cost. Countries of the southern shore have large renewable energy resources (solar in particular) and have a comparative advantage; the resources are sufficient to meet national needs as well as those of European countries that are prepared to pay a premium for “zero-carbon” electricity. Achieving regional integration requires strong network interconnections to support electricity exchanges. Presently Mediterranean electricity markets are poorly interconnected, the only interconnection between the North and the South being between Spain and Morocco. Whereas Northern countries regularly and freely exchange large volumes of electricity, the Southern countries only exchange back-up power. North-South exchanges are only possible through the Gibraltar interconnector. Developing North-South exchanges on a commercial basis can be beneficial to both Northern and Southern countries. In a first phase, Mediterranean integration through strong interconnections would allow countries in the North to export their surplus power to cover capacity deficits in Southern countries. In a second phase, the flows would reverse, as Southern countries develop their vast solar potential to meet, at least cost, the appetite of the Northern countries for “zero-carbon” electricity. Lack of cooperation between Northern and South countries, but also between Southern countries. To initiate a debate between experts, policy makers, electric companies and major players in the solar industry. The debate will identify areas of cooperation, North-South complementarities and solutions to implement for the creation of a Mediterranean energy market. The event will also be an opportunity to discuss the policies that are necessary to promote interconnection and exchanges of electricity among northern and southern Mediterranean countries. View the photo album on Flickr.